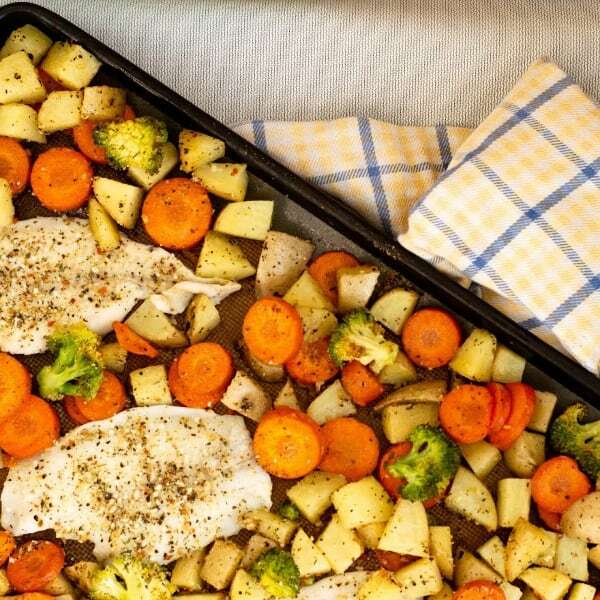 I don’t know about you, but in my world sheet pan dinners are like life savers. OK, maybe dinner saver but you get the idea. 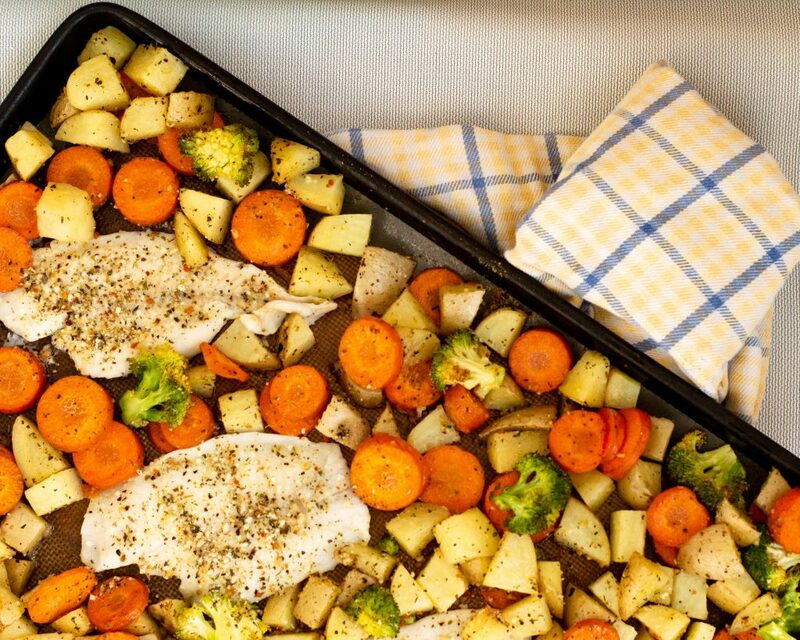 And this fish and veggie sheetpan dinner? 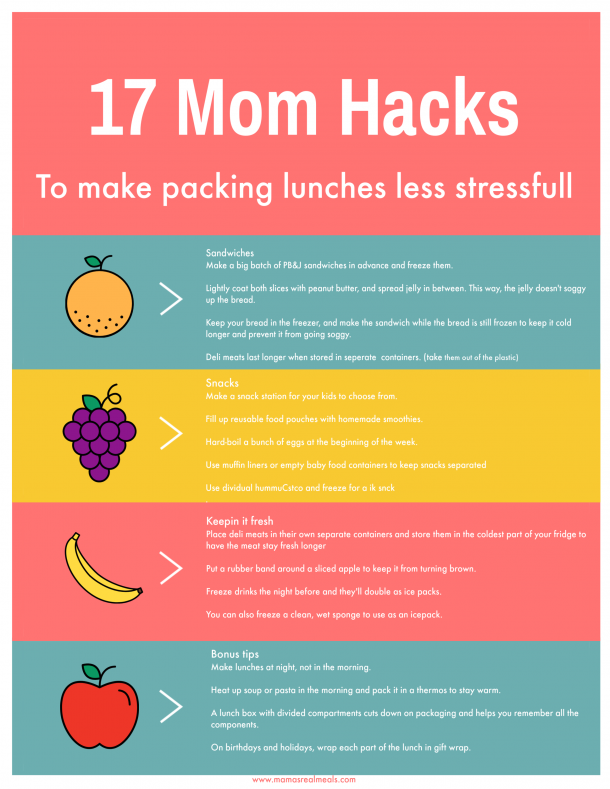 Not only is it super simple and it’s versatile too! If you house is anything like mine, dinner time, or actually the time BEFORE dinner is nuts. It honestly feels like the time between after school and then dinner time just disappears, like we just skip that hour and a half. One of these days I might get on the meal planning train so that it gets a little easier, but right now I think I’m just going to stick to my sheet pan, one pot and crock-pot dinners to stay sane! This easy sheet pan fish dinner recipe is like beyond easy. I swear even your 12-year-old can make this sheetpan dinner. With only 4 main ingredients and then a few spices, you get an easy, but still healthy dinner! 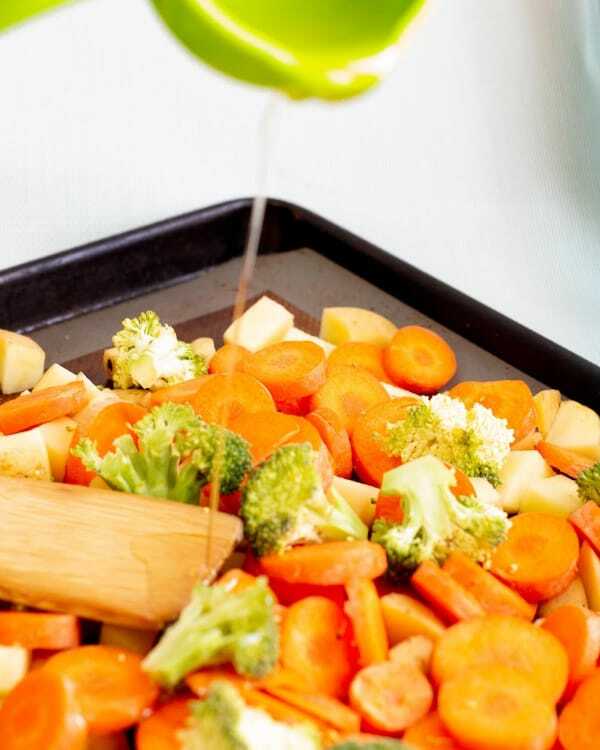 In a super short version, all you have to do is grab your veggies, cut them up and throw them on a sheet pan, then get your fish and plop that on there too, add some seasonings a bake! But I’ll expand on it a little more than that for you! 1.You want to make sure that you cut your potatoes small enough so that they will bake up in a decent amount of time. 2.Make sure that if you decide to do different vegetables than what this recipe calls for that you 1. Make sure that the seasonings blend well, and 2. That you cut them properly so they can be done all at the same time. What vegetables go with fish? This is 100% personal preference but in my opinion I like my fish best with carrots and potatoes, or broccoli! That being said though, you can serve fish with almost any vegetable. If you don’t have the vegetables that this recipe calls for you can sub it for any vegetable that you can roast in the oven, since that’s where our fish will be cooking. Since this recipe calls for potatoes, carrots and broccoli you could switch it up with bell peppers, cauliflower, butternut squash… the list goes on! If you can roast the vegetable then go ahead and use it! How long can you bake fish in the oven? Well… this all depends on the fish! But here’s a general guideline. This recipe calls for tilapia which is supposed to bake for 17-20 minutes. 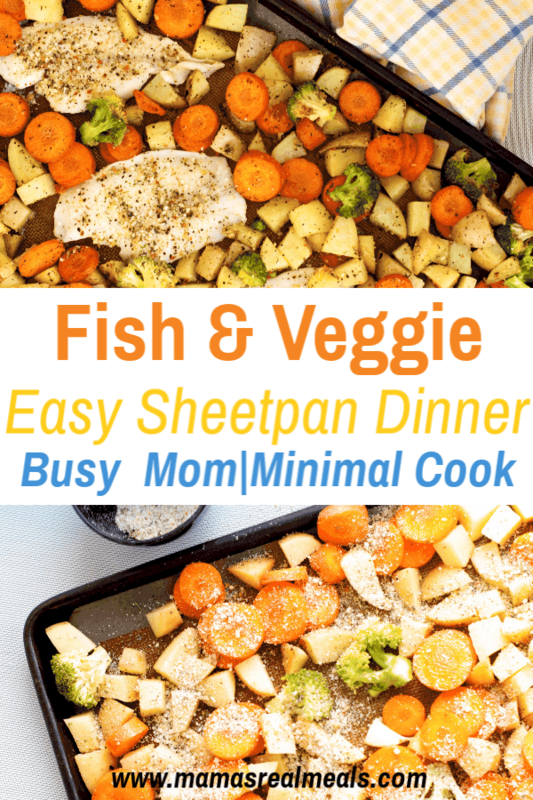 You can use like any fish with this fish and veggie sheetpan dinner! But here is a really easy way to figure out the cooking time for whatever fish you want to use: For every 1 inch of fish you need 10 minutes, with turning at half time. So for a 1 inch thick fish steak you need 10 minutes. Flipping it over after 5 minutes. Now in all honesty, I like my fish a little ‘over done’. I mean it just can’t have any slime WHAT SO EVER! So I move that time up to about 12 minutes per inch. How do you know when fish is done cooking? When fish reaches the right temperature, which is 145 degrees, it’ll be flaky and opaque. So here’s how to tell, stick a fork into the middle of the fish steak, and pull a piece out (by twisting your fork) if it flakes it’s ready! If it doesn’t flake easily put it back in for a few more minutes. How to keep your fish from sticking. The best part too is that its super easy to clean, either I can just wipe it off, or you just throw it in your dishwasher. Grab your silpat mats here! 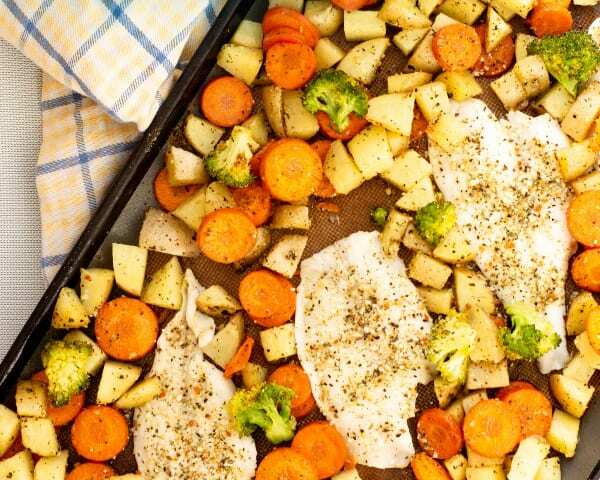 Now that we got all that out of the way so that you can get the best result, let’s go over the 5 quick and easy steps to make this fish and vegetable sheet pan dinner! 1.Pre-heat your oven to 375 degrees. Wash and cut your potatoes into ½ inch cubes. 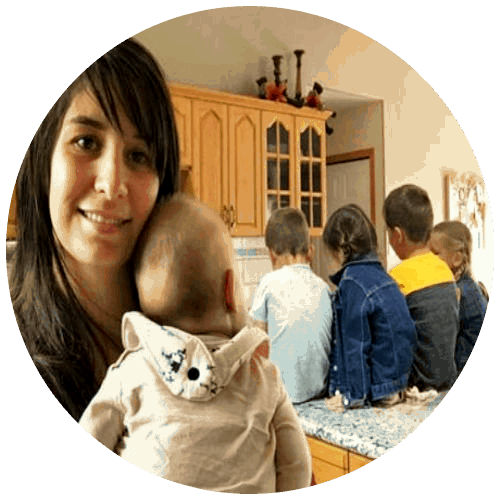 (You want them small so they don’t take a long time to cook!) Drizzle with a little oil and cook in the oven while you finish the rest! 4.Make a few ‘spots’ for your fish and add in your fish fillets. Top with remaining seasoning. 5.Put it back in the oven and continue baking for another 20-25 minutes or until your potatoes are cooked through. One little bonus tip- don’t over load your sheetpan! Use as big of a sheetpan that will go in your oven, if your sheetpan isn’t big enough to give the food some breathing room, split it between two sheets. While you might think its extra work, or even dishes, you’ll thank me later, because you won’t get the same results if the food can’t breathe while cooking! Plus it’ll also take longer to bake. This sausage veggie sheetpan dinner is also super popular too! It’s just as easy and just as versatile! Another sheetpan meal is this broccoli and chicken lemon bake! Just in case you need another idea for a sheetpan meal… here is a pepperpot sheetpan dinner! Want the real recipe for this sheetpan fish and veggies now? Preheat oven to 375 degrees. Dice potatoes into ½ inch cubes, toss with ½ tbsp oil and place in the oven while finishing the remainder of the recipe. Slice up carrots and chop broccoli into florets. Lay out fish fillets on paper towel to absorb the extra moisture. Mix together the seasonings in a small bowl and set aside. Take the potatoes out, add in carrots and broccoli. Toss with remaining oil and 2 tbps of the Parmesan mixture. Toss together. Make 4 small ‘spaces’ and add your fish fillets. Evenly spread remaining Parmesan over the fish. Finish baking at 375 degrees for 20-25 minutes!